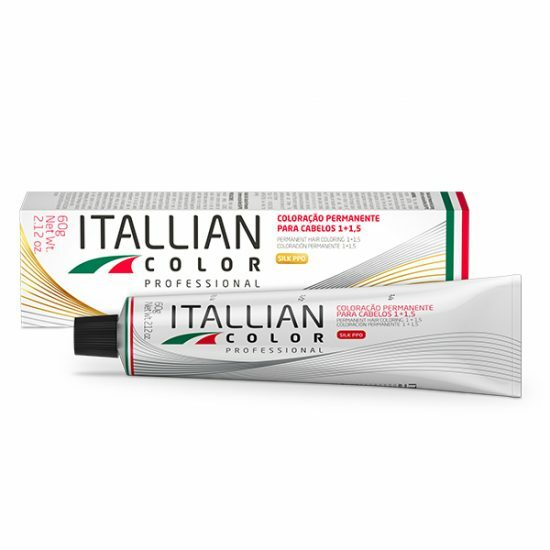 Itallian Color Professional - 100% of White Hair Coverage. Exclusive 1+1.5 color system with low content of ammonia and dyes of high-technology resistant to light and washings, ensures high-quality to product. Composed of 74 color that can be mixed with each other, allows the creation of endless nuances, making professional hair stylist’s creation unique. In addition to provide 100% of white-hair coverage. 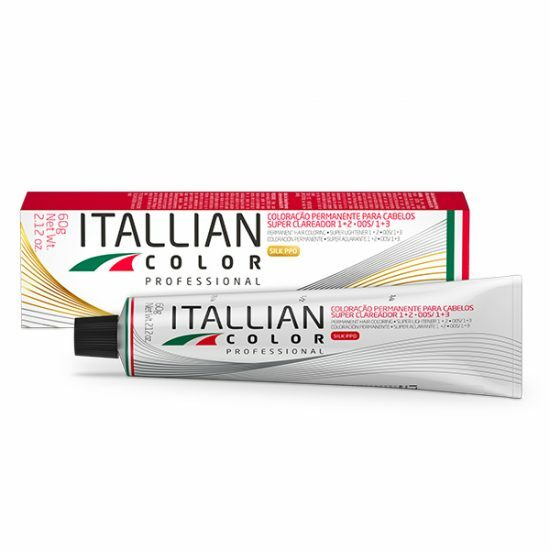 Itallian Color Professional Color provides 100% of coverage of white hair with shine and durability, while protects hair during the use with smoothness and moisture. 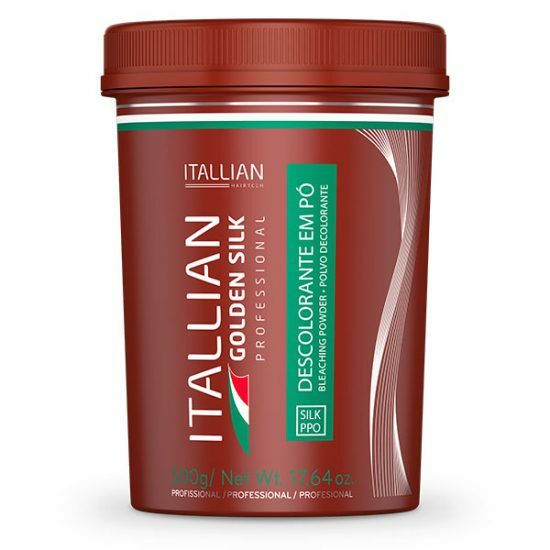 Pigments of Itallian Color Professional Color are light and washing resistant, which ensures protection against fading and intensity until the next root retouch. Itallian Color Professional Super Bleaching with higher bleaching power for different shades of blond with light highlights providing shine and brightness to hair. Opens from 5 to 6 shades with more efficiency regarding the other nuances of the Itallian Color color line. Its formula with low concentration of ammonia and adjusted alkalinity does not affect the result of the bleaching and preserves hair structure for damaging hair fiber. Itallian Oxi Developer 6 Volumes is a stabilized oxidant emulsion to color and bleach hair with Itallian Color or Itallian Color Golden Silk Bleaching Powder. Opens at least 1 shade while its texture facilitates the distribution of the mixture through the strands, without draining, while its formula with silk protein ensures moisture and smoothness to hair during the use and shine that highlights the final intensity of the color. Compatible with Itallian Color, Sopremo and Coloratto. 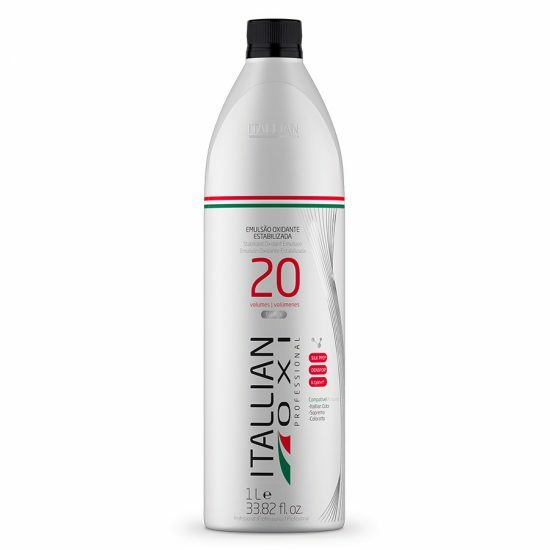 Itallian Oxi 20 Volumes is a stabilized oxidant emulsion for bleaching of up to 2 shades of hair with Itallian Color Color or Itallian Color Golden Silk bleaching. Texture facilitates the distribution of the mixture through the strands, without draining, while its formula with silk protein ensures moisture and smoothness to hair during the use and shine that highlights the final intensity of the color. Itallian Hairtech Oxi 30 Volumes is a stabilized oxidant emulsion for opening from 2 to 3 shades of hair with use of Itallian Color color or Itallian Color Golden Silk bleaching. Texture facilitates the distribution of the mixture through the strands, without draining, while its formula with silk protein ensures moisture and smoothness to hair during the use and shine that highlights the final intensity of the color. Itallian Oxi 40 Volumes is a stabilized oxidant emulsion for bleaching above 3 shades of hair with Itallian Color color or Itallian Color Golden Silk bleaching. Texture facilitates the distribution of the mixture through the strands, without draining, bleaching and techniques of streaking, while its formula with silk protein ensures moisture and smoothness to hair during the use and shine that highlights the final intensity of the color. Itallian Color protector cover protects skin during color and toning of hair without it gets stained. Avoids that pigments of the dye penetrates in the skin creating a film, which besides protecting, preserves hydration and avoids possible irritations due to the contact of the color with the area of the forehead, nape and ears. Bleaching powder for all bleaching techniques, highlights, reflex and streaking that preservers hair integrity and does not raise dust during mixture. Preserves the maximum of the hair fiber structure with agents that preserve cuticles integrity, while acting to provide shine bleaching and platinum effects and protection against yellowing. Itallian Hairtech Golden Silk is a bleaching powder indicated for all highlight, reflex, bleaching and streaking techniques. Prepared to bleach hair with Itallian Oxi stabilized revealing emulsion, according to the intended bleaching shade. Its formula contains ingredients that preserve hydration and smoothness of hair during bleaching and reduces eventual irritations during its use, besides ensuring brilliant hair in the final result. Itallian Color Moisturizing Shampoo 2.5 liter for washbasins, yields more than 180 applications. It was developed with 12 precious oils (Coco, Argan, Shea Nut, Cottonseed, Macadamia, Green Tea, Chamomile, Aloe vera, Calamus, Myrrh, Oliva and Cinnamon) and silk protein, providing effective protection against dryness, Deep nutrition of the hair fiber, frizz control, hydration, shine, softness, wetting and emollience to the hair. 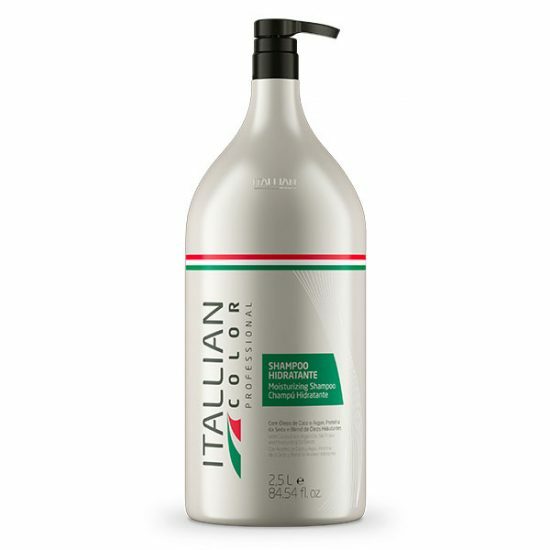 Itallian Color Moisturizing Conditioner of 2.5 liters for washbasins, yields more than 180 applications. Developed with a mix of 12 precious oils (Coconut, Argan, Shea Nut, Cottonseed, Macadamia, Green Tea, Chamomile, Aloe vera, Calamus, Myrrh, Oliva and Cinnamon), Silk Protein, Panthenol and Silicones. Provides effective protection against dryness, prevents double tips, deeply nourishes the hair fiber, controls frizz, moisturizes, gives shine, softness, wetness and emollience. It has a silky touch effect.